3-year-old Talal was trying to climb stairs. It was an ordeal for him, so his father, Wasim, picked him and started walking upstairs towards the Physical and Rehabilitation Center. Wasim lives in Lyari and works as a security guard in a private company. He has two children – a daughter and a son. His daughter was healthy but his son, Talal was born with a congenital deformity. Since Talal’s birth, Wasim took him to various hospitals across Karachi but didn’t get any help. Seeing Wasim worried and sad, one of his colleague suggested him to take Talal to the Indus Hospital. In July 2016, Wasim brought his son to TIH. Doctors suggested that Talal could only be offered non-surgical treatment. 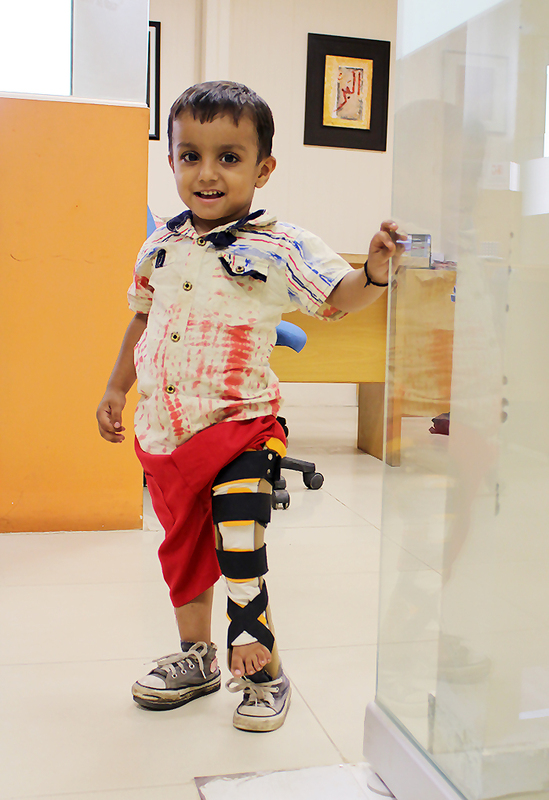 Mehwish Zakir – an Orthotist/Prosthetist professional at Physical Rehabilitation Center of Indus Hospital, Korangi Campus explained, “Talal has a short leg syndrome. His femur and tibia are short. It is a congenital disorder and it often happens because of the position of the developing foetus. Potential treatments for such patients include: Prosthetics (artificial limbs); Orthotics (splints or braces); Surgery; Rehabilitation (physical or occupational therapy). However, it varies for each patient. Talal has been prescribed to wear ankle-foot brace which will balance the length difference between his legs”. After several months of training and rehabilitation, Talal is now walking on his own with these aids. Seeing Talal walking and moving independently is a joy for Wasim and his family. The Physical and Rehabilitation Center was established in collaboration with ICRC, and Chal Foundation in 2015. The Center aims to provide prosthetic and orthotic devices to handicapped patients, both adult and children. The Center has now established two centers at IHN hospitals in Lahore and Muzaffargarh. To-date more than 80 patients have been provided with ankle-foot braces and have enabled them to walk independently.